It could be McCaw's (c) final home match for the All Blacks. Record-breaking New Zealand captain Richie McCaw paid tribute to the “absolute champions” alongside him after his likely farewell appearance on home soil. The All Blacks retained the Bledisloe Cup with a thumping 41-13 win over Australia at Eden Park on Saturday in McCaw’s 142nd Test – taking him beyond Ireland’s Brian O’Driscoll as the most capped player of all time. They now head to a World Cup in England and Wales which is set to be the last hurrah for McCaw and the likes of Ma’a Nonu – who signed off with a rampaging two-try display, Dan Carter and Conrad Smith. Smith was also on the scoresheet while Carter kicked 16 points and McCaw said at a post-match presentation screened on Sky Sports 3: “They’re absolute champions. “The jersey means a whole lot but the people that fill it up are the ones that put all that effort and energy in. “I’ve been so lucky, and I think those guys will agree, to have each other side by side over so many years to go through the tough times and the good times. “Those men have all given a huge amount and our success has come from their attitude and their talent. McCaw made his debut in 2001 and has captained his country at three World Cups, finally lifting the Webb Ellis Cup in 2011. He has also been named IRB international player of the year on three occasions – 2006, 2009 and 2010 – but remained humble as he was honoured in front of a crowd of 48,457. “The first day I pulled on this jersey, I didn’t want to let it down – I wanted to add to the legacy and still tonight that was the goal,” he said. The Wallabies had won 29-17 in Sydney last week but had no answer in Auckland to Carter’s craft and Nonu’s power running. McCaw said: “The Bledisloe means a hell of a lot – it’s always a hell of a Test match. “Last week we were on the receiving end but it’s amazing how it can change. The physicality and the way we’ve been this week shows what it means between both teams. Breaking through: Adel Al Hendi. Adel Al Hendi has declared the UAE are “here to make a statement” as they head into the first leg of the Asian Under-20 Sevens Series in Malaysia Friday. 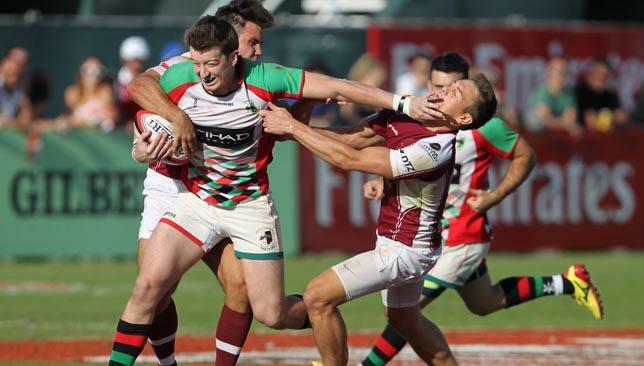 The 20-year-old Abu Dhabi Harlequins’ winger has been named captain for the Series as the UAE take on hosts Malaysia, Singapore and Kazakhstan in Pool 1, hoping for good results and a chance to play for a medal. Al Hendi is expecting the toughest test to come from Malaysia, but he believes the new-look UAE team can spring a surprise. In their last outing in Hong Kong in December, the UAE won two of their seven games, but three defeats were by just two points. “I reckon Malaysia will be the team to beat. Apart from being the home team they’re skillful and know what they’re doing. If we can shut them down though, hold possession and stick to our plan there’s not much that sides will be able to do to defend against us. The UAE will be hoping for an improvement on last year Series when they finished in a three-way tie for sixth out of nine teams taking part. “I think we can surprise a few people and being captain for my last season is enough to get me in gear,” Al Hendi added. 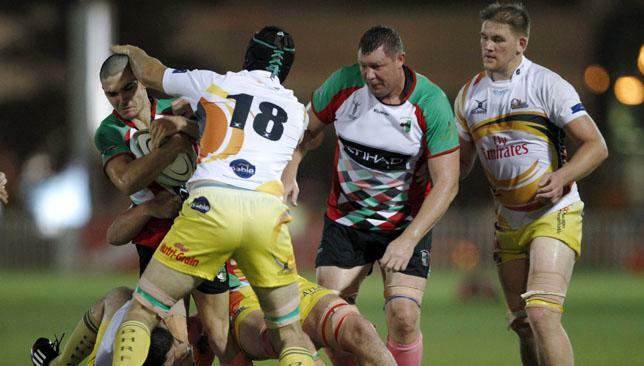 Chris Marshall playing for Abu Dhabi Harlequins against Doha last season. Chris Marshall says Abu Dhabi Harlequins are brimming with confidence ahead of the new Gulf rugby season and doesn’t feel the reigning UAE Premiership and Dubai Sevens champions have many weaknesses. The winger admits Zayed Sport City is a joyous place to be at the moment and says he cannot wait for the new season. The Englishman has also hailed the impact new head coach and compatriot Mike McFarlane has had on the club in his short time in charge, admitting the new man has got Quins really firing ahead of the new campaign, which kicks off in just over a month. “This year there’s certainly confidence. I’ve been here three years and this is the most confident I’ve been going into a season,” said Marshall, 25. “It’s a really positive place to be at the moment and I’m enjoying it, knowing the guys we’ve got and Mike McFarlane, who’s impact on the club has been fantastic. “He’s a really positive bloke. He loves coaching and is really driven and he’s had a real positive impact on the guys who’ve been here a few years, to get them going again for the season. “Equally, through his network, he’s brought in a few players who are all of a good standard, who I think will add a huge amount to the squad. I can’t see many places where we’d say we’re weak. It was a stop-start season for Quins in 2014-15, who recovered from losing two straight games at the start of the Premiership to make the final. After losing to Dubai Hurricanes and Jebel Ali Dragons, Jeremy Manning’s men beat Abu Dhabi Saracens, Dubai Exiles and Xodus Wasps, and made it four straight with a 39-19 demolition of Canes in the final. Despite also capturing the Gulf Men’s League title at the Dubai Sevens, Quins tailed off after Christmas, surrendering the Gulf Top Six title they had held for the past three seasons. Several players went down with injury, including Marshall, as younger siblings Sarries took glory in the second half of the campaign by beating Doha to win the West Asia Cup. He and Quins have no complaints about finishing third in the GT6 though. “The season was injury interrupted for me, as always. I have had a few seasons like that. I really enjoyed it though. We won the Premiership, which was massive for us,” said Marshall. Marshall is clearly motivated, but just in case any Quins players needed firing up for the new campaign, their opening Premiership fixture on September 25 is a tantalising capital city clash with rivals Sarries. “It’s Saracens first up, so we’re really up for that, as always. We’re confident but it’s a big challenge,” said Marshall.